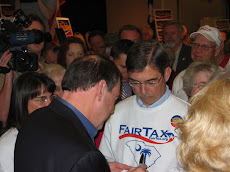 Below is a response from a subscriber to ReturnToExcellence.net & a FairTax supporter to the subject message that contains many points that will undoubtedly be presented in future messages re the debt ceiling & the 2012 FY budget. 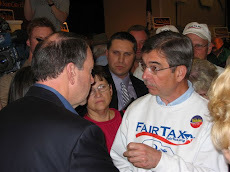 Yes Cain debates well and yes, a FairTax (FT) champion, preferably a President, may provide the best odds for FT passage. U.S. financial circumstances however may present a FT opportunity QE3 this year. How? 2  Federal Reserve has been financing perhaps as much as $4 billion per day since November 2010. 3  Private estimate US consumer inflation range from 6% to over 10%. 7  Odds are low that Congress will pass a deficit reduction measure as part of debt ceiling extension that will increase the confidence of our creditors and the IMG/G20 in the risk of investing in US Treasuries. 8  Fed repeatedly states that it will stop printing $'s to purchase US Treasuries (end of QE2) June 30. If 7 and 8 occur, expect the 10 year Treasury Bill to jump from 3 ½ % to over 6% in a week. Without the Fed, interest rates will automatically go up to reflect real inflations with pressure to jump to over 10% week 2 given risk of poor returns (per falling $) or outright default. A  via 0% federal corporate tax rate, position the US overnight as an entrepreneurial friendly haven. Foreign and domestic investors and venture capitalists would plan to take advantage of this; hence $ would stabilize. B  save $450 billion per year (reference: economist Art Laffer) due to abolishment of the IRS. That $ reducing the debt will result in more private entrepreneurial opportunities. A & B may then prevent an economic Armageddon and offer the US with another opportunity to fix its financial house. This would entail cutting bloated government and privatizing bankrupts entitlements. Let us then make the case positioning the FT as a serious 2011 alternative.